If you are heading out on a camping trip with your whole family, you need to make sure that you have the right sleeping bags in place for everyone. It’s important to have sleeping bags that meet the needs of your children because adult sleeping bags simply won’t do the job properly. These days, there are plenty of kids sleeping bags on the market that you can make use of. But which one is going to be best for your child? As a parent, you will want to provide the very best for your child, but you can only do that once you’re informed regarding the options out there. Below, you will find information and reviews of three of the best sleeping bags for kids that you can purchase today. Read on now if you want to broaden your knowledge and find out which kids sleeping back you should throw your money at. The Coleman Kids 50 Degree Sleeping Bag is a product that has a lot going for it. It has an attractive shiny lining on both the inside and the outside. It weighs just 2.4 pounds, so the makers have managed to keep it very light. This makes it portable and easy for kids to move around if and when they need to. Its dimensions are 14.1 x 7.9 x 7.9 inches. This might not be quite big enough for all kids, but most will find it adequate. Coleman states that the sleeping bag is suitable for kids 6 years and up. But if you’re buying this for an older child, or a child that’s taller than average, you should compare its length to your child’s height to be sure that the sleeping bag will be big enough. It’s easy to roll up, and there are straps attached to the sleeping bag to make this process even smoother. You just have to fold it in half length-ways before doing this. The design of the sleeping bag is certainly one of its major selling points. It has a turquoise color that looks great and very child appropriate, perfect for boys or girls. But what will make it go down even better with young children is its glow in the dark finish. It’s a fun little feature that takes it to the next level. All in all, the Coleman is a functional sleeping bag and has a few good things going for it. It will certainly meet the needs of children. Furthermore little features like the roll straps, the internal pocket and the glow in the dark design are a welcome attention to detail. However, there are some parents who have used the product and found that the sleeping bag is too small for larger children. It also doesn’t offer ideal warmth and protection from the cold when temperatures really start to drop. If you still decide to go with this product here are some additional tips for keeping warm while camping. Any minor criticisms of this product are blunted by its low price tag and the value for money it offers. TETON is a brand that makes sleeping bags for people of all ages, as well as other camping products. It’s a trusted brand, and it’s not hard to see why many parents turn to their products when buying kids camping gear. The overall quality of the build and the materials used is very strong indeed. It’s not a cheap option, so the quality of stitching on seems should be good and we’re happy to report they are and should remain strong for a long time. The bag weighs 2.65 pounds, making it light but not as light as the Coleman. In terms of its size, the sleeping bag is 26 inches wide and 66 inches tall. That’s a pretty good size for a kids sleeping bag, and it should mean that most if not all kids will be able to use it perfectly well. It boasts strong temperature protection for your kids as well. It has a -7°C/+20°F temperature rating, and you couldn’t ask for much more than that from a kids sleeping bag. You also get a limited lifetime warranty when you purchase the TETON Sports Celsius Junior. One of the features that TETON talks about a lot is the sleeping bag’s ability to work with other TETON products. It’s useful for people who own other products made by the brand in terms of style in this instance. But if you don’t, it doesn’t mean much. The major downside of the sleeping bag is that it can only be washed by hand. The materials are strong, but they’re hardly accommodating when you consider that this product is going to be used by young children. It’s going to get dirty sooner or later. 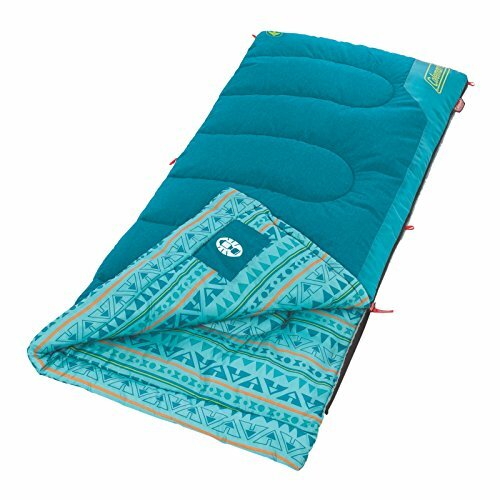 In conclusion, the TETON Sports Celsius Junior for Kids is probably a safer and stronger option for parents than the Coleman sleeping bag reviewed above. It’s built to a higher standard and uses better materials. It’s also better for use in cold conditions but as per the Coleman it’s not for Winter camping conditions. The fact that it’s hard to roll up and offers no straps to ease this task will frustrate some parents. As will the fact that this is a hand wash only product. But if you can live with these issues you’ll be rewarded with a pretty decent product. So not the winner here but still one of the best kids sleeping bags available. 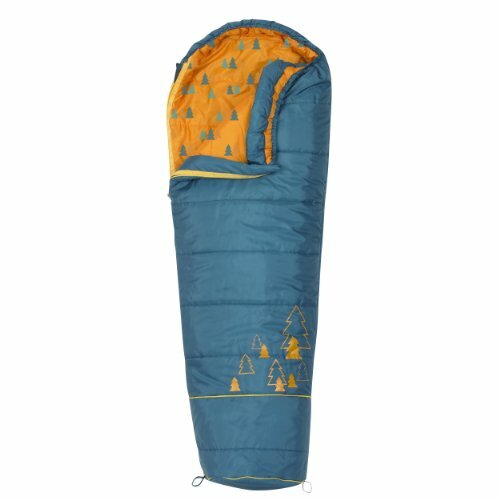 The Kelty Big Dipper 30 Degree Kids Sleeping Bag does what it says on the tin. It’s a product that manages to truly impress simply by getting the basic things right and doing what you expect it to. The design is stylish, with a maroon exterior and orange interior, complete with patterns. It looks cute, and the design will please children of all ages. It’s very good at keeping your child warm though a drawstring around the head area would help to prevent heat from escaping. It is also extremely comfortable and nothing is more important than that for your child. At over 3 pounds this is bigger and bulkier than the competition and thus the heaviest sleeping bag on test. However that extra bulk might just be worth it. At 28 inches by 69 inches this is also the most spacious kids sleeping bag discussed here. Uniquely this product incorporates an expandable foot section. As your child grows so can the sleeping bag making it a better long term purchase than the competition. The Kelty Big Dipper is a fantastic sleeping bag for parents who want a product that can do the basics right. It has a lot to offer in terms of offering comfort and warmth, and those two things are paramount when you’re camping outdoors. This doesn’t mean it takes up more space, though. The most impressive feature is the expandable foot section. This allows you to add a few inches at the bottom of the sleeping bag as your child grows and needs more room. The only criticism is the lack of a pull string that can keep heat in the bag, but even that is not a major problem. It is the most expensive of the three sleeping bags but the features justify this additional expense. Kelty Big Dipper 30 Degree Kids Sleeping Bag, Blue, Stuff Sack Included - Childrens Sleeping Bag Ideal for Campouts, Backpacking, Sleepovers and More. Overall Verdict – Which are the best sleeping bags for kids? The clear overall winner here is the Kelty Big Dipper. It does what you need a good kids sleeping back to do. It’s warm, it’s comfortable and it has extra features that take it that step beyond the competition. Partner this with a self-inflating sleeping pad a camping cot or better still portable bunk beds if you have more than one child and you have a great sleep system away from home. But if you’re looking for something more compact and easy to fold away, the Coleman is worth considering. That’s especially true if your budget is tight. Lastly the great quality TETON sleeping bag will suit budding young backpackers who need a product they can rely on in terms of holding up to constant abuse in use.